We say that building great culture really starts with your employees. If you were to think of your company like an economy, your employees are what drives that economy. Treat them well, and your company will flourish. If you have been following us, then you already know that we talk about company culture a lot. We talk about it internally, we talk about it with our clients, and we write about in our blog. Often, we talk about what makes great culture and how to achieve it. You may or may not have heard of a little company called Jysk. Just a little Danish company with over 2,000 retail stores in 40 different countries that sells household goods such as mattresses, furniture and interior decor. Using the Quality of Work Life method, they have increased profits by about 4,700 € per employee. That is actually about a 25% increase to their profit margins, all attributed to utilizing Quality of Work Life to make big improvements throughout the entire company down to each individual store. So what exactly is our Quality of Work Life Index? It’s a science-backed method of uncovering specific areas of improvement within any organization in five categories. 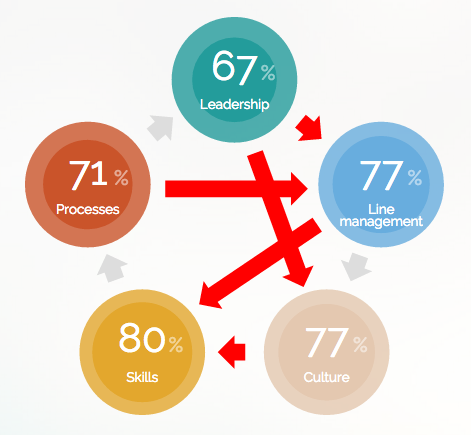 These categories are leadership, line management, culture, skills, and processes. In each category, various questions are used to survey every single employee. How they answer these questions can determine where there needs to be improvement and how to do it. In some way or another, each category has a direct impact on a different category. The example above is a screenshot of what our clients see when they are reviewing their own data. Leadership could definitely use some improvements, but even more important to take note of is how Leadership has a direct impact on things like Line Management and the overall Culture of the company or department. Using the QWL method, your company’s index can easily be tracked throughout the year which will help leadership make better informed decisions in real-time. Using your index as a benchmark, noticing improvements becomes easy. Just like Jysk, you will be able to increase productivity by identifying and eliminating unnecessary work. We’re seeing similar results like that of Jysk across the board. Regardless of company size, type or location, any organization can benefit from making such improvements in every aspect of the business. Great leaders aren’t ones that just go around telling people what to do. They are the ones that listen. If you want to start measuring your company's QWL index reach out to us and we will show you how. You can also download a White Paper about the topic below.